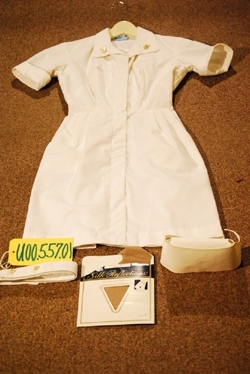 This white color woman's dress is dated 1982. 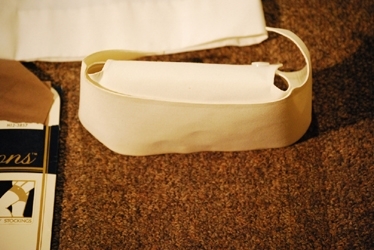 It is a US Army, "Dress, Hospital Duty Uniform". 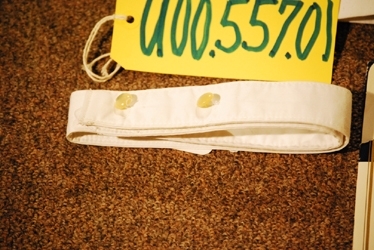 The condition is EXCELLENT, with just a faint trace of the usual age yellowing which in this case makes this dress more rich looking in appearance. This woman's dress was worn by Officer's and Enlisted women alike. It was intended that this dress be worn for hospital duty type work, however they were sometimes worn informally as garrison dress. Each lapel has the metal insignia of a nurse. 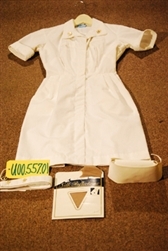 This uniform also comes with a pair of museum added 1987 dated, beige color stockings, original to this uniform a white color belt, and a white color, nurse's, ward hat. This dress is a real BARGAIN! The hat alone is worth $80.00 on the collector's market, and the collar pins bring in over $60.00 a set. 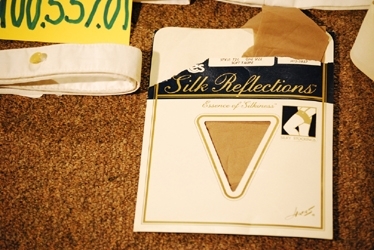 The stockings are worth another $15.00, so you get the picture what a bargain this grouping really is for the savvy collector. 1987 dated, US Army/Navy/Air Force, "Dress, Hospital Duty, Uniform" WWII Period, US Army Woman's Army Corps., 2nd Lieutenant, Service Dress Uniform Coat 1941 Dated, US, Ivory Color, Woman's, Wedding Dress With A Super Long Train, And With Accessories Large Air Force Grouping Belonging to a Husband and Wife named: "William E. Pasutti" & "Eva Parsons Dow"